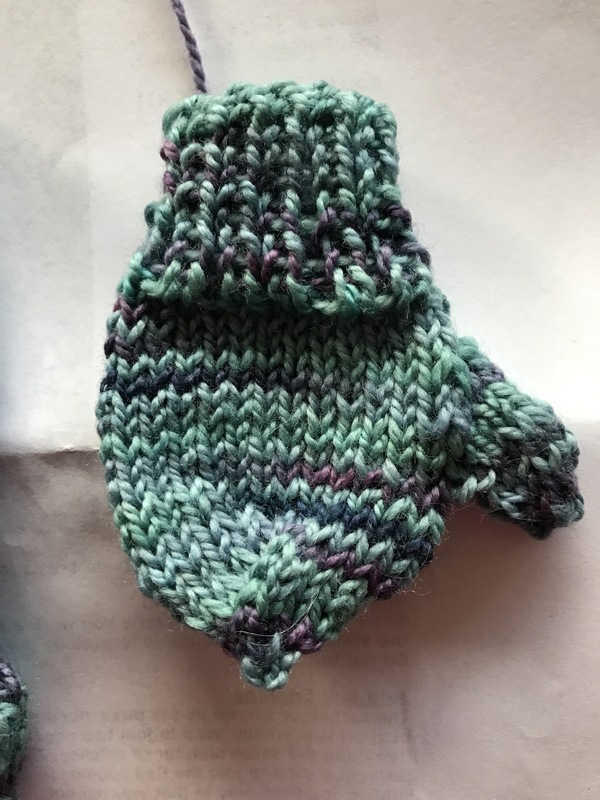 Tiny socks followed by tiny mittens. Using size 2 needles cast on 24 stitches. Knit 1, purl 1 around for a total of 10 rows. Next row: switch to stockinette and at the same time increase 3 stitches evenly. Next row: knit 13 stitches, pm, k1, pm, knit to end. The stitch in between the markers is the beginning of the thumb gore. Round 1: knit to first marker, slip marker, m1, knit to next marker, m1, slip marker, knit to end. Repeat rounds 1 and 2 until you have 9 thumb stitches. Next round: knit to market, place thumb stitches in a holder and remove markers, knit to end. Next round: knit to space where thumb stitches were, m1, knit to end. Next round (decreasing starts): knit 7, k2tog, around. Repeat this round until 3 stitches remain. Break yarn and pull through remaining stitches. Pick up held stitches and divide equally between dpn’s.